Product prices and availability are accurate as of 2019-04-12 05:59:19 EDT and are subject to change. Any price and availability information displayed on http://www.amazon.com/ at the time of purchase will apply to the purchase of this product. 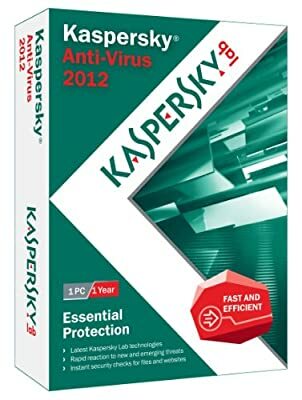 Kaspersky Anti-Virus 2012 is the backbone of your PC's security system, delivering real-time protection from the latest malware and viruses. It works behind-the-scenes with intelligent scanning and small, frequent updates, while proactively protecting you from known and emerging Internet threats. Real-time protection against viruses, spyware, Trojans, rootkits, and more. Vulnerability Detection to seek out and repair compromised programs. Website and email scanning to detect malicious software. Fast and efficient with small updates and intelligent scanning. Rapid reaction to new and emerging threats.